The other day on Twitter, I mentioned that my January blog calendar was nearly all planned out. Someone replied asking how I go about figuring out my blog posts so far in advance, and her question felt like it deserved it's own post. So, I picked out the first open date on my blog calendar, and planned for writing about a plan. Lots of people have written about this sort of thing, and I'm adding to the conversation because I think it's helpful to hear it from different people with different styles. My blog schedule is probably the most organized thing in my life, so please realize that I'm not an expert when it comes to things like this. I think I've just found my groove on this one thing! Before I get to the planning and scheduling, I need ideas. 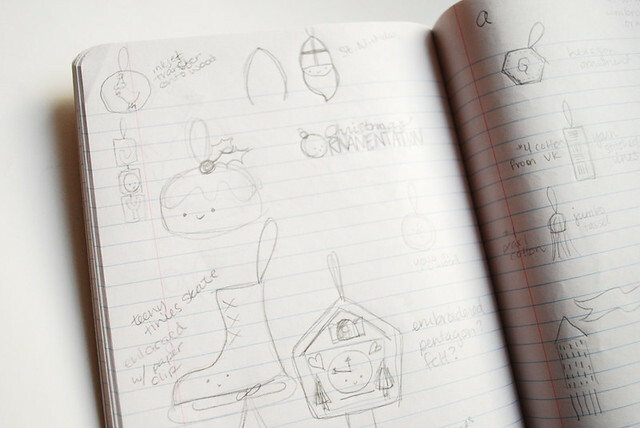 My notebook is never too far away from me because you never know when an idea for a post or project might come up. 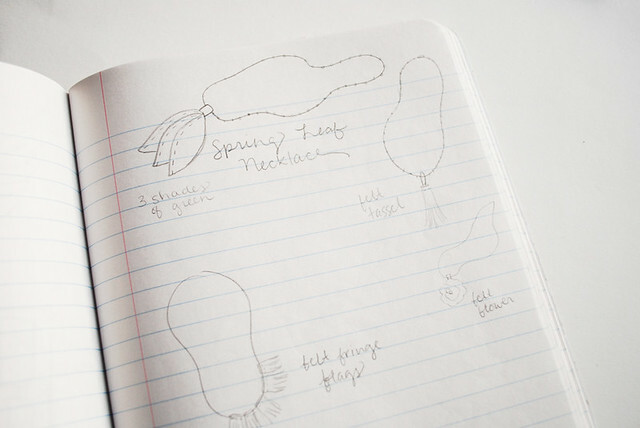 I like to jot down what it is and sketch it out. Often I'll create several versions of one thing...sometimes I use one of them, other times they become a series. Sometimes I use the ideas immediately, other times they are for months in the future, and sometimes they never end up as anything. But you have to start with ideas. I've found that the more ideas that I work on (and trust me, it takes some work to come up with them! ), the more ideas I have. My Christmas Ornamentation series was going to be just five posts in one week. It ended up being three jam-packed weeks, and there were some ornaments that I scrapped. How did that happen? When you start with one idea, then consider the options, then think about other uses, then change out some materials, then try...and it goes on and on...you can suddenly have lots to work with. Quantity can lead to quality. Wild Olive has three main categories of posts, plus all the extras. These categories are: patterns (embroidery), projects (crafty diys), and printables (PDFs for you!). Part of planning means looking at what my options are for these types of posts. Actually, these are the areas that I work on the farthest in advance because they take more work up front, before the writing and posting can ever happen. 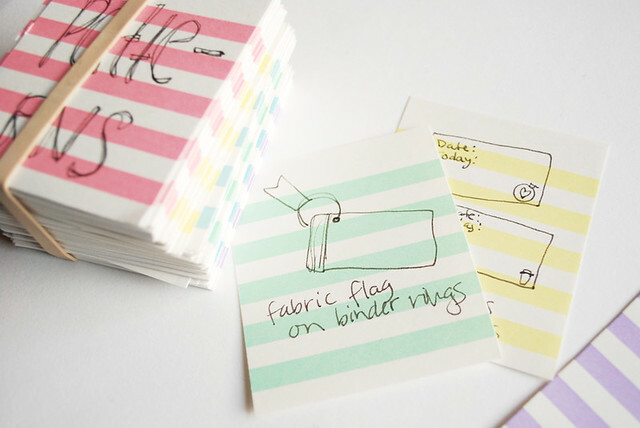 Elsie from A Beautiful Mess recently shared a snapshot of her planning process, and the color-coded cards above are my own version of what she showed. I'm still just playing with this style, and I haven't decided if I'll use it long term. For now, it's really fun to see a stack of ideas, and have them sorted by color category! Dividing things into sections helps balance out the ideas. Once I have the ideas to choose from, I pull up my Google Calendar. It's my favorite tool for organizing blog posts (I still write out some lists and such on paper or a white board, but the main calendar is online). You can click on the image and get a better look at what January looks like (but I did keep a few things hidden...I don't want to spoil too many surprises!). Even when I'm only working on a particular week, I like to use the monthly view. All I have to do is click on a date, I type what my post will be, mark it for my "BLOG" calendar, and save. It makes an all-day event, which is fine for me. Rarely do I add more information than this, because I just need to see what is happening when. Usually I start by putting in some posts that are "features". These kinds of things can be a life-saver, for example, my Snapshot Saturdays are always on Saturday, and they are simple to do. I also choose when I'll be doing any posts to feature my sponsors. After that, I consider any holidays or special days that I need to match posts up with. For example, Chinese New Year comes later this month, so I'll have a post or two for that. Once I have those kinds of things figured out, I fill in with the ideas that I've been accumulating in my notebooks and on my cards. And here's the best part about working in Google Calendar...you can move around the events by dragging and dropping! I need flexibility in my life. Sometimes I just can't get something happening on a date that I planned on, or I realize that I should slip a post in sooner rather than later. And so I move things. Just because I have a plan all worked out, doesn't mean that I live and die by it. That said, seeing all of those little squares filled in makes me feel a lot more comfortable. Seeing the schedule prepares me for the work. Just because I have all of these posts planned, doesn't mean the work is done. Now it's time to do them! The nice thing is that having the calendar lets prepare and pre-schedule posts in advance. Amy from Lemon and Raspberry has some great advice about this, but if I'm being honest, there are times when I post something "just in time". And that's okay! Most of the time, however, I avoid the panic of "what should I post about today? ", which is sort of the point. Wow, that was a wordy post for me! But I hope that my own experience with blog planning has been helpful for you. If you have any questions or tips of your own, please leave them in the comments! I'll be commenting and answering along with you! 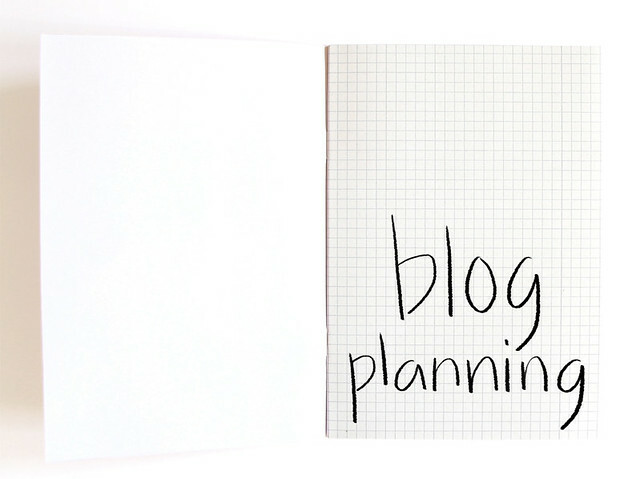 PS: If you like planning on paper, take a look at my Blog Buddies planner pages, or the blog planner that Tara and I made! Wow! You do plan ahead! That's great! I'm a fly-by-the-seat-of-my-pants kind of blogger. Inspiration strikes and I'm on a roll. I do have a notebook with ideas in case I get get stuck though. I'm wondering, do you have a set theme for every day of the week? I've been playing with this idea and think it would work pretty well for me. Thoughts? I do the same thing and my calendar fills up fast too (except for this month for some reason). I run 2 week long series on my blog and am getting ready to start a 3rd soon. The calendar makes managing it so much easier. Gretchen: I don't have a set theme. I've tried to do something similar to that, but I'm not able to keep it for too long. Instead I try and fit things in as they feel right in the overall plan. For example, I'll look and see that I haven't done a pattern for a while, so I put that in, or maybe the posts have been super full, so I add in a post that is quick and easy to read. Themed days can have the same effect and they work well for others, but they've just been difficult for me. 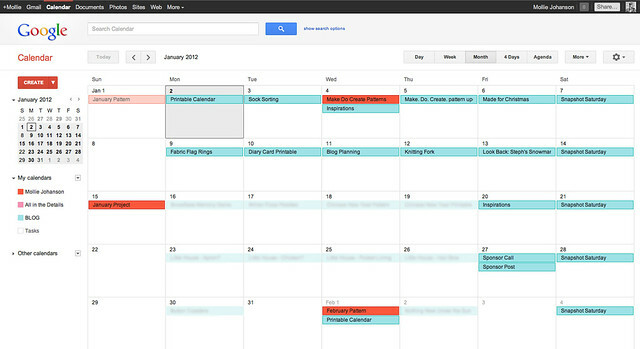 I never thought of using my Google calendar for planning my blog! I have been writing them out on paper and sometimes misplace the sheet of paper. The first month I did some advance planning (and scheduled posts ahead of time) was in December. I felt I spent less time on the computer overall and was better organized. I have been slacking on the planning and really need to get back to it. I second Katie. I've been doing the same thing, but all by hand! By the end of the month my paper looks like a major eraser mess from all my "editing". Must give the google calendar a try! I've only just started my blog, and until I started, I hadn't even considered all of the planning involved. I thought I'd just hop on the computer whenever anything interesting had happened. You've posted this at the perfect time for me - thanks Mollie! I used to use a separate calendar in Google Calendar, but I use a combination of your blogger planner printout (thanks!) and the Wordpress plugin "Wordpress Editorial Calendar", which is so useful - it lets me drag and drop posts about, so if I'm really organised (ha! ), I can make sure I have the right posts popping up on the right day. Oh dear. My blog schedule is probably the most UNplanned part of my life. I'm in awe of your organizational skills! I do have a little notebook with ideas, but that is really chaotic, too, and often I just decide on a whim on what to post. This is such a great and helpful post! I love hearing how other bloggers plan and organize themselves so I can take little bits and try them out for myself. I've also been trying Elsie's categorizing method, and I will definitely try out your google calendars ideas! 2012 will be my most organized year yet, haha, thanks! Such a helpful post! I've just recently started using google calendar too to organise my blog posts and since I co-own our company with my sister, it's especially helpful that we can share the calendar together so there's no chance of double posting! I didn't realise you could drag schedules around though. Something I am now quite excited about :) Thanks! Just wanted to say thanks so much for sharing your process....Funny thing is that I have been using my Google Calendar for over a year now for keeping a track of my budget but never thought to use it here. I couldn't live without mine. But will be adding a new folder now. Thanks again for the tips. Fantastic post -- I do a LOT of planning ahead like this. I write for several other blogs as well, in addition to my person space, so I have all of my posts for them marked so I know what I'm up to on any given day! Hi, could you tel me where you sourced the striped paper/card from?